It’s a new year and a great time to check your key considerations for your business in 2019! 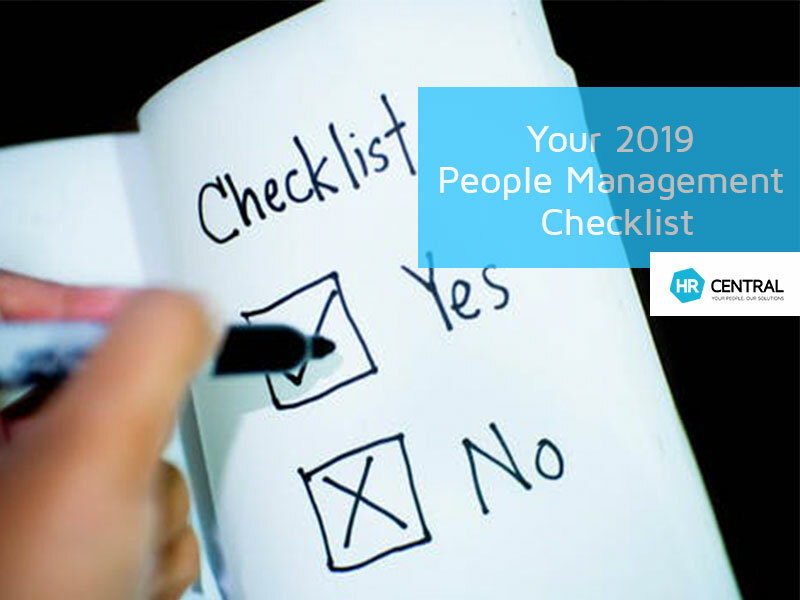 Its imperative that you have your “people management” in order. By doing so at the start of the year can help have your team, and therefore your business, working like a well-oiled machine so you can turn your head to running/growing the business. Here are some of our key considerations that should definitely be on your list. Do you have a tick or a cross against these points? If you have ticks – then you are well on your way. But… if you have crosses, it might be a good idea to get in touch with one of the HR Central team who can provide you with the right resources and advice to turn those crosses into ticks. So ticks or crosses, which is it? Having policies tailored to your business, is a great way to make sure that your employees understand and acknowledge how you want your business to run. This can include codes of conduct, like dress code, smoking, drug and alcohol consumption, as well as behavioural such as abandonment of employment, performance management, social media and flexible working arrangements. Policies should be clearly written in plain English so that they cannot be misinterpreted. There should also be a function whereby as an Employer/Manager you can see which employees have/have not read and agreed to each policy. That way there is no confusion as to whether or not your staff have read and understood your business protocol. Changes to Long Service Leave (LSL) provisions (Victoria) – now available to employees after seven years continuous service with one employer. Increase in the minimum wage in July – making it $18.93 per hour or $719.20 per 38 hour week (before tax). Domestic Violence Leave was introduced allowing employees to take unpaid leave to deal with family and domestic violence (for all industry and occupation awards). Changes to entitlements of casual workers – casual workers who have been working continuously over a period of twelve months for the same employer can request to convert to part time or full time employment status. Single Touch Payroll is a change to the way that Australian employers report their Employee’s tax and superannuation information to the Australian Tax Office. Employers use a payroll or accounting software that offers STP to send the employees’ tax and super information to the ATO each time they run the payroll. As of July 1 2018 this was a mandatory requirement for Australian businesses with more than twenty employees. I didn’t recruit well and my recruitment process needs amending? I didn’t have a thorough and well mapped out induction process? There is no plan set for my staff so that they feel that they are valued, and there is a room for their development and growth? That I didn’t allocate appropriate tasks to my staff correctly – that is give them work that is tailored to their strengths so that they can give the best of themselves? Did I acknowledge poor behaviour early, and make a clear plan and line of communication to that staff member to resolve the issue? Do I motivate and recognise great behaviour? All these points can be resolved with easy planning and communication to ensure that the best is brought out in your current staff, that you find great new staff, and that you have a successful retention plan to keep those good team members. This is a great time to review your internal culture. Stand back and be honest. Is it a safe and harmonious place to work? Would you want to work there? Do you encourage staff social activities so that individuals get a chance to learn more about their colleagues in a more relaxed environment? Do you have team bonding retreats/off-sites, where you can share some of the business direction and ideas for the future with the team so that they feel a part of the “bigger picture”? There are lots of great outsource businesses/websites that can help you gather some information on any of the above and work on building a solid and positive workplace culture that is cohesive and productive. We’d love to help you get the support and assistance you need. So here’s to a great 2019 and make it your goal to get some of these ticked of your list. Get in touch and let us know how you go! How do you deal with Employee HR questions?